This post is a continuation of a post where I wrote about learning to understand what you see by breaking down complex subjects into their simplest shapes and forms. Practicing this is helping me overcome feelings of overwhelm when I want to draw more realistically or tackle complicated scenes. 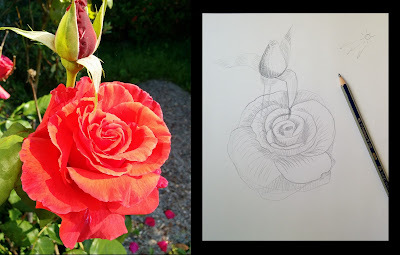 I started with a very generalized, simplified sketch from my reference photo, looking at the basic 2D shapes and beginning to indicate the contour lines on the bud, leaves, and petals. 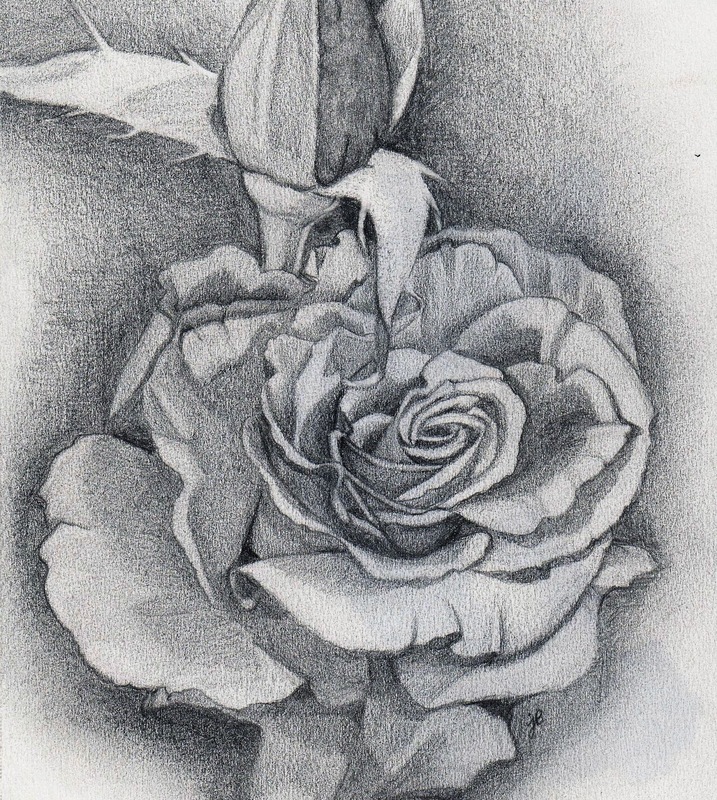 Next I focused on the elements of the roses in terms of simple 3D forms and did some practice sketching. I broke the rosebud down into a cone sitting on top of a half-sphere and the stem into another half-sphere on top of a cylinder. If this is all sounding easy so far, add +1 to your creative confidence stat. Then I considered the overall shape of the rose in full bloom. 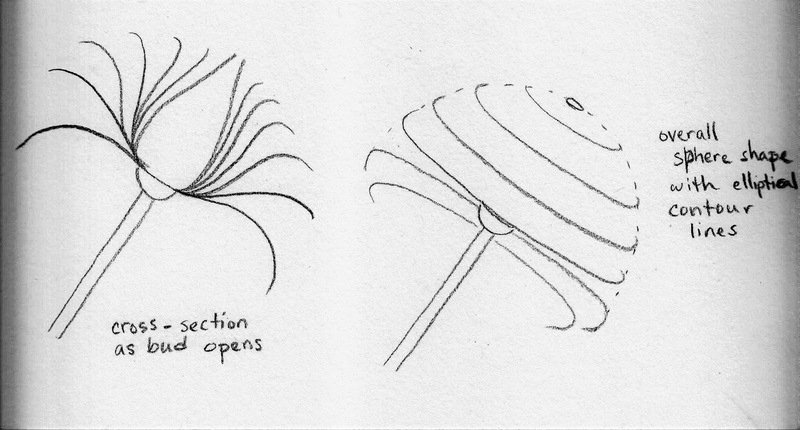 I sketched a cross-section of what happens as the bud opens. 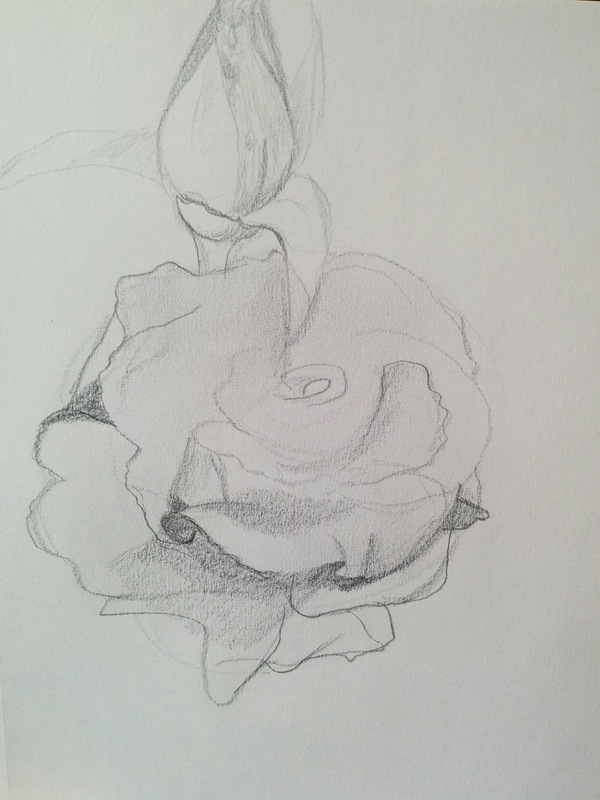 I noticed that the overall shape could be simplified into another sphere and I indicated elliptical contour lines as hints about where petal edges would fall. Now that I had gained some concrete understanding about what I was seeing, I could more confidently look at each petal without getting so overwhelmed by the abundance of detail. As I began my drawing I started from the outside with the simplest shapes (bud, stem, leaf) and the largest petals. I concentrated on the underlying 3D structures one by one as I worked in towards the center, applied shading, and added detail bit by bit. 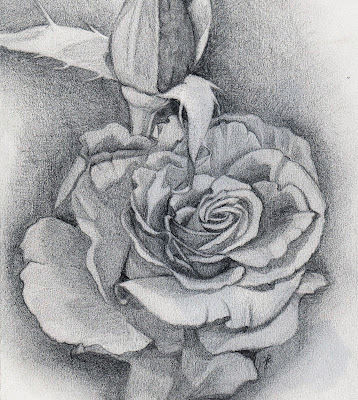 I wish I had kept track of how many hours I spent on this drawing. I worked on it over the course of a week, a little bit here, a little bit there each day. 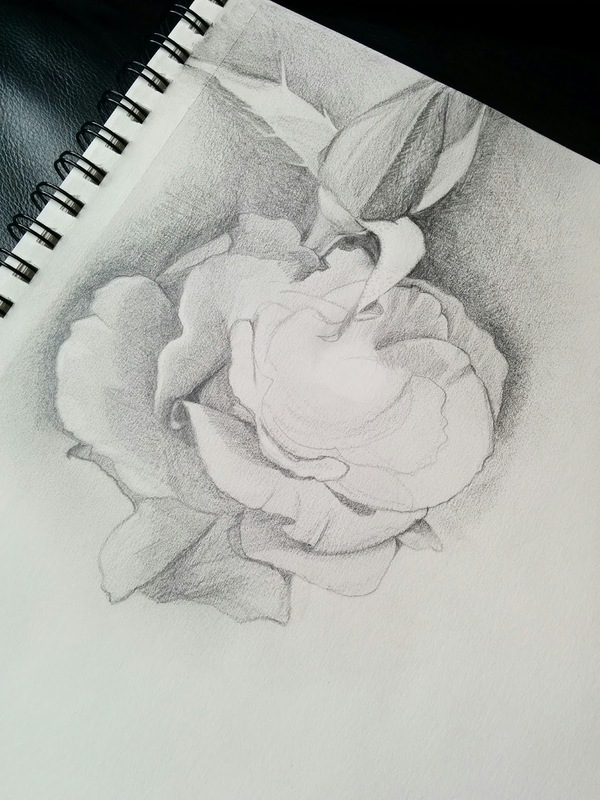 And even with my strategies for breaking down the complexity into manageable pieces, I will definitely admit that I started to feel the eye strain as I really honed in on those myriad of ruffled center petals. Here is the finished study.